A water level exploits the fact that water always finds its level. Looking at the surface of water formed in two vessels, we can aim at the horizon and determine the projected eye-level. If we are at a sufficient altitude, we should be able to observe that the horizon —the line separating the sky and the ground— lies below the eye-level. As we climb higher, the larger is the dip. Conversely, as we approach sea level, the dip approaches zero. 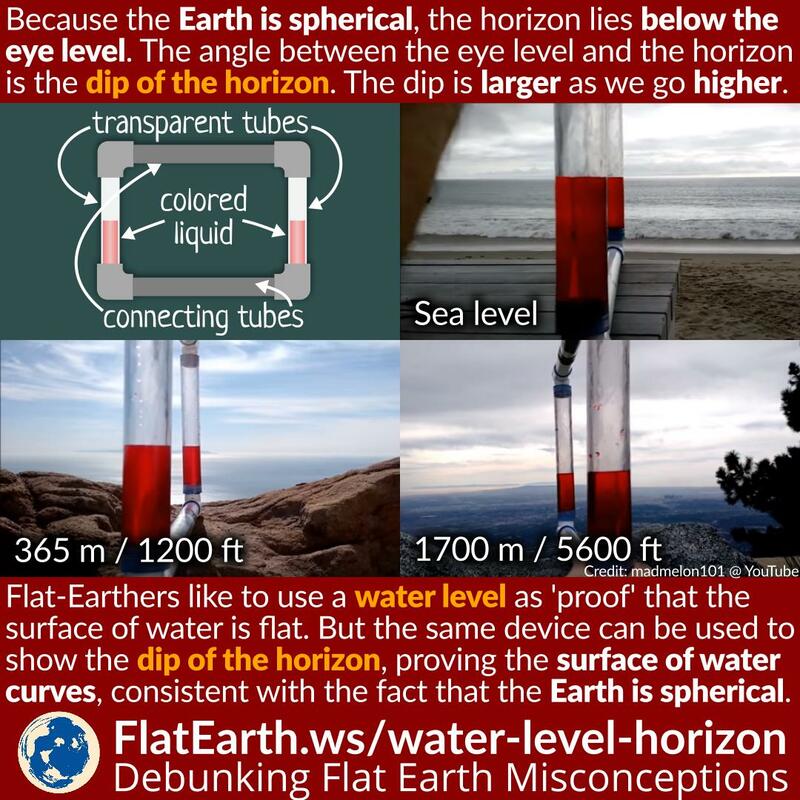 Flat-Earthers often use water level as ‘proof’ that the surface of the water is flat. They are wrong. The surface of the water is level, or equipotential, but not perfectly flat. “The horizon always rises to eye-level” is claimed by most flat-Earthers. But some of them —presumably after reading this piece— claims that the dip of the horizon also happens in the flat-Earth model. So, we created this diagram to illustrate what would happen in the flat model. If the distance to the ‘edge of the world’ is 5000 km, then the dip of the horizon from the altitude of 2 km is 0.023°. It is not that much different from 0°, or ‘horizon is at the eye-level’.